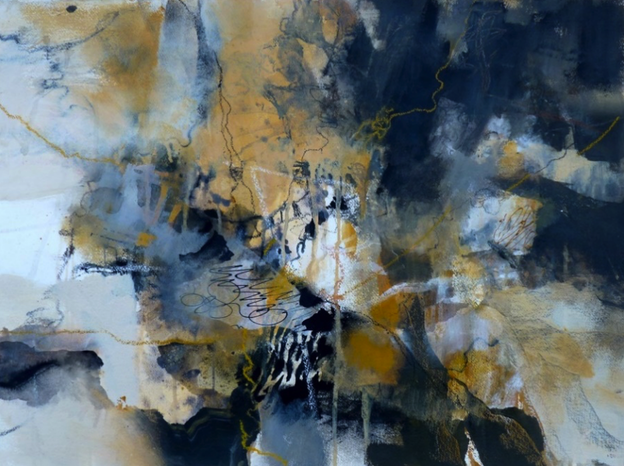 Kathleen Scoggin was awarded First Place for her painting Carbon Count II at the March 2019 Member Show “Understated Surfaces”. We love this painting and are thrilled to share a little information about Kathleen with our arts community. Can you tell us if you had any special inspiration for this painting? I am so honored with the award given my painting at the March member show. I usually work with organic shapes and love using neutrals as my color pallet. The under painting actually was a demo I did at one of my workshops. The use of the blacks and grays led to the name Carbon Count II. My goals when painting are to balance a spontaneous approach with strong composition and design. The spontaneous “ let the water media do its thing” is the fun part, while the application of design principles is the hard and often frustrating part of the artistic process. I love the challenge of always trying to paint a better painting!I have always loved art, but put it on hold during my career as a Clinical Dietitian and Food Service Director for large institutions. My husband, Paul along with the help of my artist mother in law gave me a gift of a complete set of watercolor supplies before I retired. I began taking workshops to build my skills and have been painting ever since. I treasure the friends I have made in the art community and the good times we have had thru artistic activities. We know you are long-time member of the San Diego Watercolor Society. Can you tell us a little bit about your favorite aspects of the organization? I became a San Diego Watercolor Society member when I took a workshop here some years ago. I feel so fortunate to belong to a watercolor society with a gallery to show my art as well as continue to grow with the great workshops they provide. This entry was posted on Saturday, March 2nd, 2019 at 1:00 am	and is filed under Member News, Shows / Exhibitions. You can follow any responses to this entry through the RSS 2.0 feed. You can leave a response, or trackback from your own site. Excellent work, Kathleen. I enjoyed meeting you In February.